When a male voice boisterously announced the start of Dong Choon Circus Troupe's daily show on a sunny afternoon on March 8, about 20 audience members ― from a young couple in their 20s to a group of elderly patrons ― gave a generous round of applause. The visitors are appreciative because the day's show in the 600-seat yellow tent on Daebu Island in Ansan, Gyeonggi Province, would have been cancelled if there were fewer than 10 people, according to circus policy. Fifteen nerve-wrecking displays ran for 90 minutes on stage, beside which a banner reading "Tradition and Trust Established Since 1925" and "From Memory to Art Circus" hung from ceiling. The performers ― 10 women and nine men ― ended the show by presenting themselves to the audience. The voice that started the show bade farewell to patrons, reminding them not to leave anything behind. Korea's oldest and most tenacious circus troupe ― with 15 other groups having vanished decades ago ― was not familiar to all the patrons. An elderly man, who came with his wife and baby grandson from Gwanak-gu, southern Seoul, knew about the troupe's history and visited the tent out of "poignant memory." But a young couple from Ansan were unaware of the troupe's legendary history and said they came after checking its tacky website. "I saw Dong Choon when I was a teenager living in Osan and saw it many times more afterwards," said a man in his 70s, who came with his wife and two grown-up children from the Gyeonggi Province city. "They used to do other things as well, like skits, musical performances, magic tricks and gukak (Korean classical music). So I am still attracted to Dong Choon." Among the visitors were the troupe's former member Kim Myung-seop, a midget whose nickname was "the small giant," and his two daughters and their husbands. One of the couples brought their baby girl born days ago. "A sparrow cannot go without dropping by a mill, can it?" said Kim, who had worked with Dong Choon for 10 years and left it to found his own eponymous performing group named after his past moniker. With the day's event wrapped up, the troupe's director Shim Sang-chul closed the tent's entrance and left in his car. The patrons and most of the staff had already gone. The tent and its empty parking lots are again as lonely as they were hours before. The desolate scene resembles the inside, where the performers risked their lives doing dangerous stunts in front of mostly empty seats. This is not atypical of Dong Choon shows on the island since 2011. An acrobat and a hat-trick performer wait for their turn behind the curtain. Dong Choon President Park Sae-hwan comes to the tent from his Seoul office in Geumcheon-gu every weekend to host the show. Park, 70, whose strength is limited but passion for the troupe is second to none, continues to manage the tent. Having spent 50 years with the circus, he even guides visitors' cars on Saturday, when the venue is at its busiest. It allows him to eavesdrop on what people say about his troupe. But whatever keeps him busy, only one thing occupies his mind: a desperate need for Korea's first circus school to nurture youngsters to keep the brand's legacy going and prolong the life of Korean circuses that blossomed in the 1950 to 1970s. "Without a circus school, we cannot teach aspirants," said Park, pointing out that he is responsible for the troupe's labor issues, tax, finance, promotion, program direction, lights, sounds and inventory management because there is no young blood to fill his shoes. 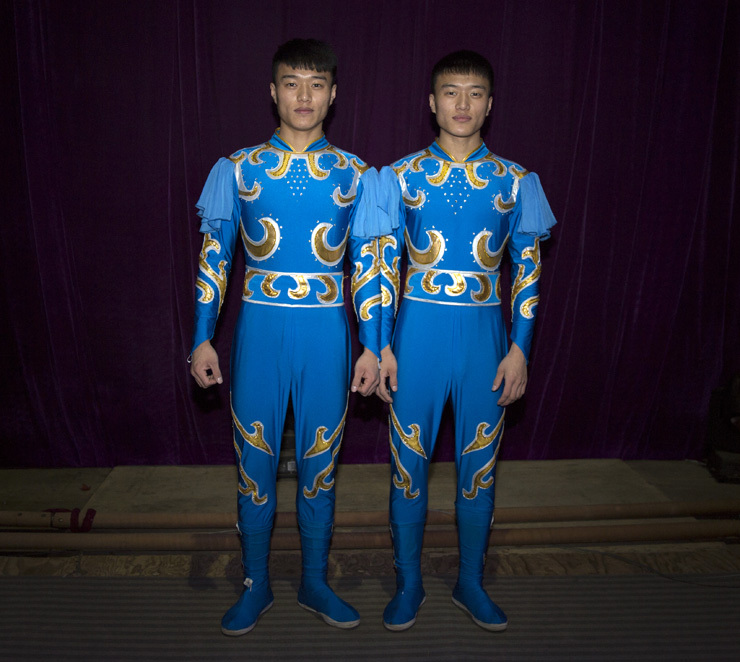 "To be part of circus, members must start receiving training at age nine or 10. China has about 100 circus schools, France more than 20 and Russia 40. We have nothing." In 2014, Park asked the Ministry of Culture, Sports and Tourism to build a school, only to receive the cynical response that he was "trying to stoke briquettes when everyone else was using gas boilers." "The government does not understand the significance of keeping Korean circus alive," said Park, who worked with Dong Choon as an actor and standup comic alongside people who later became top entertainers, including singer Ha Choon-hwa and late comedians Nam Seong-nam and Lee Ju-il. 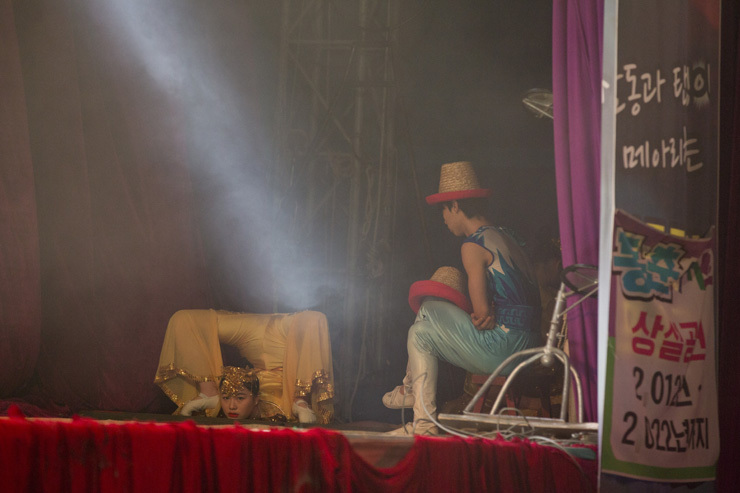 The absence of a Korean circus school led to Chinese performers being brought in under contracts lasting up to five years. Five year ago, 80 percent of Dong Choon's members ― more than 40 ― were Koreans while the rest were foreigners. During its heyday before the advent of television, videos, computers and smartphones, the troupe was pure Korean. Now, except for a few technicians, all performers are Chinese. Considering the brand's deep-rooted history in Korea for nearly a century, the ethnic blueprint is hard to dismiss as acceptable. "There are eligible Korean aspirants who trained themselves privately, but it costs more than 10 million won ($8,700) per person to hire them," said Park, whose troupe was designated as a social enterprise by the Ministry of Employment and Labor in 2015. "I thought it better that I scout Chinese at cheaper rates, whom I can manage to direct better and still roll out high-quality programs,"
"Dong Choon" is a compound word that put together the middle part of the troupe's founder Park Dong-soo and the Chinese-based Korean word "Choon" meaning "season of spring," implying "a hopeful land." The name encouraged Koreans living under Japanese rule during the colonial period (1910-45). Until it settled on Daebu Island, the troupe travelled from village to village across the nation, erecting a tent at each stop, performing inside for about a month and moving again with 14 eight-ton trucks carrying their equipment. The journey was not easy, sometimes with floods, snow storms or typhoons, and not knowing how many people would come to the shows during the busy farming seasons. "Some destitute old women used to bring their grandchildren to us, asking us to raise and train the children as troupers because otherwise they would starve to death," said Park. He said that Korean circus had the second-longest history in Asia, after Japan's Kigure Circus, which was more than 100 years old. Dong Choon enjoyed phenomenal popularity until the 1970s, when there was not much other entertainment. In that underdeveloped society without mass media and high-rise modern architecture, the troupe's colossal tent was a treasure trove, known far and wide. "We used to have the second-most variety of animals in Korea following Changgyeongwon Zoo (A royal palace from Joseon Dynasty that became Korea's first zoo in 1909)," Park said. "Jenny was our pride, an elephant given by a Chinese circus that visited Korea. She died at 45 in the 1980s." He said his troupe had literally taken in 80-120 billion won during its 85-year history. 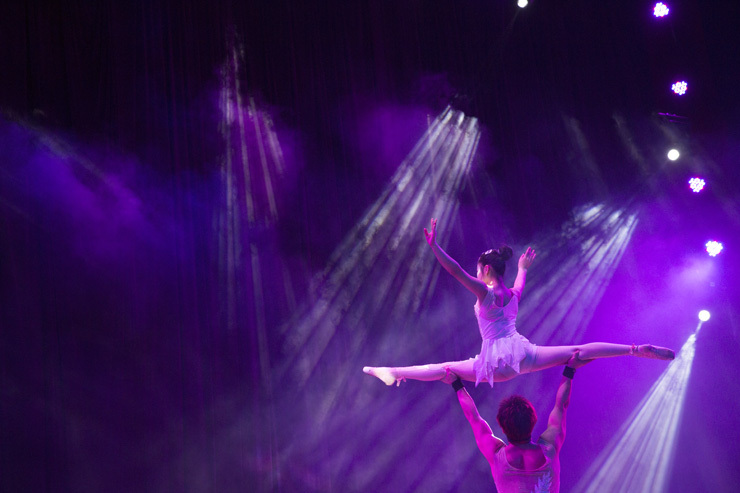 Pin lights shoot through the smoke-filled stage to highlight two acrobats. The legacy began to wear out in 1974, when KBS1 TV drama "A Journey" swept the nation and people sought different kinds of entertainment. Many circuses shut down, and Dong Choon struggled. The biggest blow came in 2003, when typhoon Maemi destroyed the tent and about 1,000 visitors had to seek safety. Many performers lost hope and left, forcing Park to keep the troupe going with makeshift tents made of cheap fabrics often used by snack carts. With money earned since, he managed to buy land on Daebu Island and erect a steel-beamed yellow tent. "I want to preserve the basic principles of circus, which are the extreme tricks that modern circus troupes tend to replace with clowns and less dangerous gimmicks," said Park. He said Korean circus had many folklore elements that would appeal to foreign tourists like dances using fans and double-headed portable drums or chang (traditional narrative song). He believes in the power of direction. This was exemplified when his troupe's"New Hong Gil-dong" show, based on the popular Korean literature figure much like an Oriental version of Robin Hood, played to sell-out audiences for years since 2011. Park also believes in the commercial potential of circuses. High-profile circus troupes around the world, from Pyongyang Circus to Canada's Cirque du Soleil to China's acrobatic shows, make up almost 60 percent of ticket sales for stage performing arts worldwide. And most of the circuses are supported with funds and dedicated theaters. "We are a social enterprise so we cannot charge much," Park said. "But if I had 2 billion won, I could make Dong Choon the world's best."